Edwin Mah Lee, (李孟賢) the mayor of San Francisco, died unexpectedly on 12 December 2017. He was born on 5 May 1952 in Seattle, Washington, the son of Gok Suey Lee and Pansy Chin Lee (Chan Ngar Ching). In August 1937 Lee Ling Hung swore in an affidavit that he was a citizen of the United States and the holder of Certificate of Identity No. 34552 issued when he entered the Port of Seattle on 9 February 1921. He was applying to bring his son, Lee Gok Suey, into the United States. 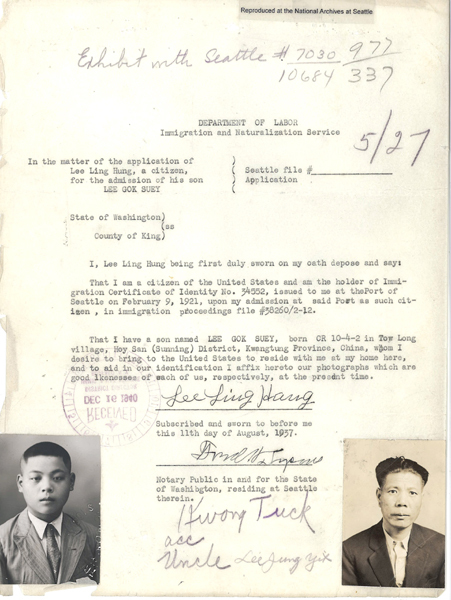 “Affidavit with photos of Lee Gok Suey and Lee Ling Hung,” 1937, Chinese Exclusion Act case files, RG 85, National Archives-Seattle, Lee Gok Suey case file, Seattle Box 747, 7030/10684. Lee Gok Suey arrived in Seattle, Washington on 20 December 1937 on the Princess Marguerite and was admitted four months later after a difficult but successful appeal. He was 17 years old, a student and the son of Lee Ling Hung, a United States citizen and Luey Shee. He was born on 9 May 1921 in Taw Long village, Suey Low Section, Hoy San District, China. 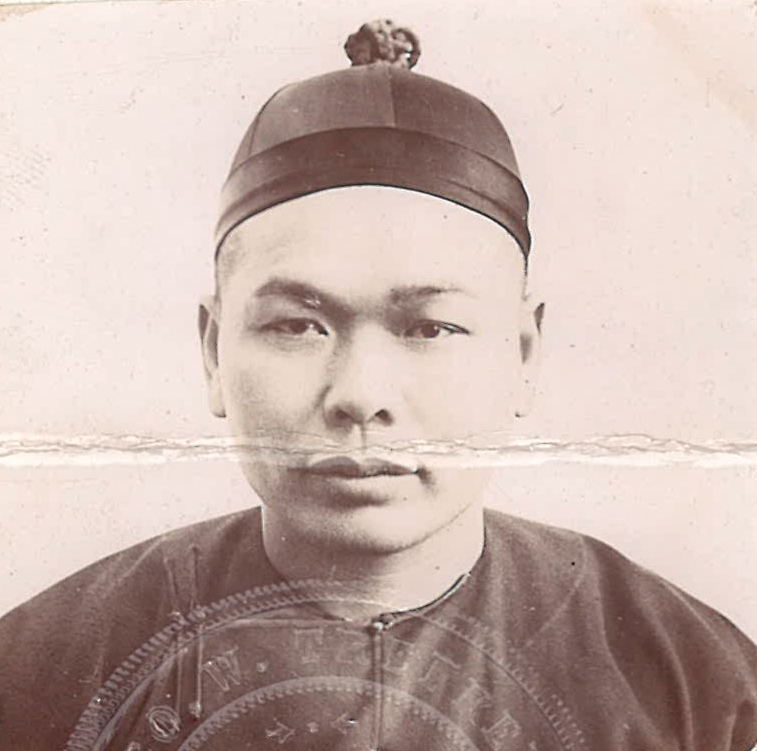 Originally Lee Gok Suey was denied admission by a board of special inquiry because he was not able to prove to their satisfaction his relationship to his father. 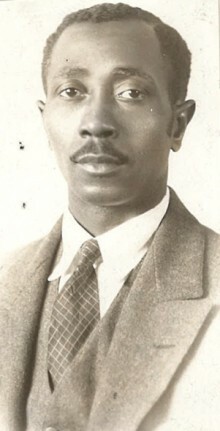 Seattle’s Inspector-in Charge, Joseph H. Gee, re-opened Lee’s case so additional evidence could be obtained. Affidavits from his father, uncle and grandfather were submitted to the board for their review. The applicant’s attorney filed a letter and an affidavit of the applicant’s alleged grandfather, Lee Share Young, and included a photograph with a satisfactory resemblance to Lee Gok Suey. Because of several discrepancies in the witnesses’ testimony the board voted unanimously that Lee not be admitted. His attorney argued that it had been fifteen years since the grandfather had been to China so it was not unusual that his testimony might not completely agree with his two sons who had been to China recently. After more than four months, Lee Gok Suey’s arrival was approved. 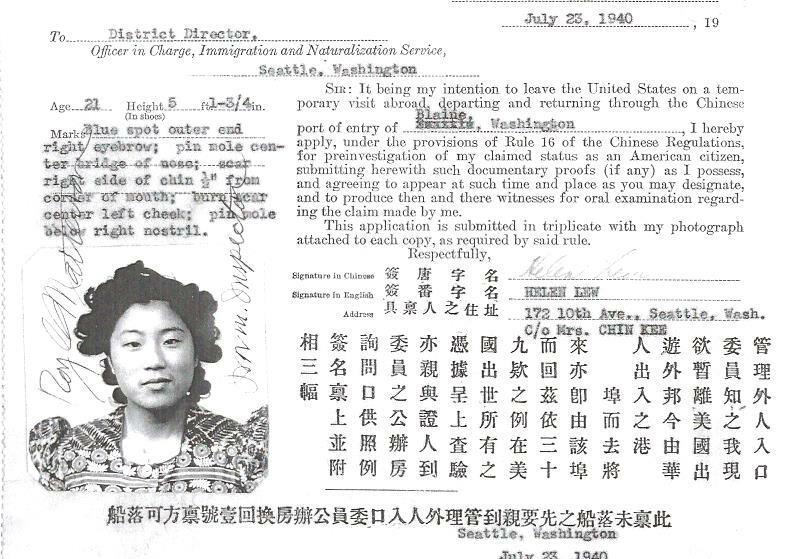 “Certificate of Identity Application, Lee Ling Hung,” 1921, Chinese Exclusion Act case files, RG 85, National Archives-Seattle, Lee Hing Hung case file, Seattle Box 433, 7030/719. Before moving to Seattle Lee Ling Hung lived in Portland, Oregon for about six years and he was a baker for Coffman’s Candy Shop at 152 Broadway. In 1920 Lee Share Young swore in an affidavit that he wanted to bring his son Lee Ling Hung over to the United States. At that time he was a merchant for the Quong Sang Wo Kee Company in Portland, Oregon. He produced his 1888 discharge papers for the interrogators inspection. 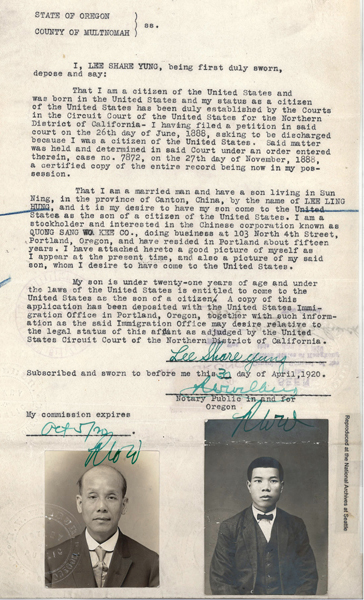 “Lee Share Yung Affidavit with photos of Lee Share Yung and Lee Ling Hung,” 1920, Chinese Exclusion Act case files, RG 85, National Archives-Seattle, Lee Share Yung case file, Seattle Box 118, 1010/18-8. “Lee Share Yung Affidavit,” 1902, Chinese Exclusion Act case files, RG 85, National Archives-Seattle, Lee Share Yung case file, Seattle Box 118, 1010/18-8. 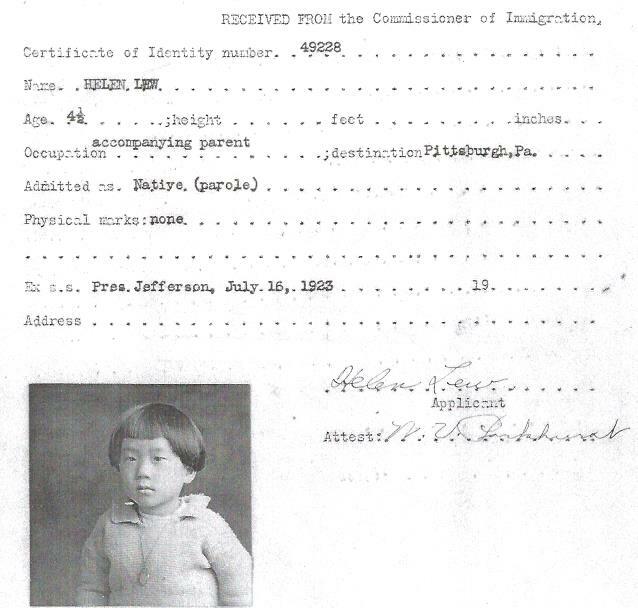 When Lee Shere [Share] Yung left for a visit to China in 1900 he obtained an affidavit with his photo attached to assure his reentry into the United States. He swore that he was a member of the Wau Yune Lung Kee Company, dealers in Chinese merchandise and provisions doing business at 739 Commercial Street in San Francisco. He had four witnesses: Chas. E. Harris, O. R. Beal, Frank B. Hoyt and Edgar A. Greenblatt. Lee returned on 2 May 1902. “Lee Share Yung, Habeas Corpus Petition,” 1888, Chinese Exclusion Act case files, RG 85, National Archives-Seattle, Lee Share Young case file, Seattle Box 118, 1010/18-8. 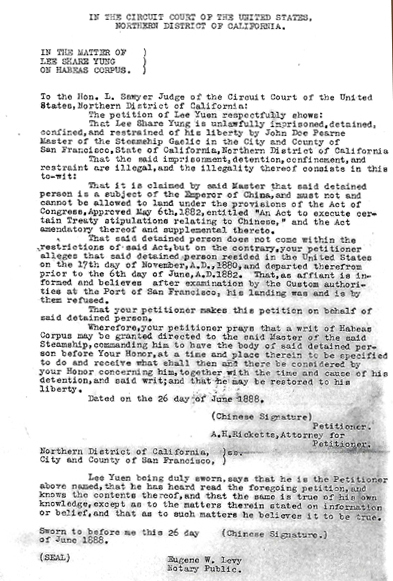 “Lee Share Yung, Habeas Corpus Judgment Roll, page 2,” 1888, Chinese Exclusion Act case files, RG 85, National Archives-Seattle, Lee Share Young case file, Seattle Box 118, 1010/18-8. Lee Share Young, Lee Gok Suey’s grandfather, was born in San Francisco, California on 7 December 1871 to Lee Yeu May and Hong Shee. His marriage name was Lee Yeow You and he was sometimes known as Lee Yung. He married Toy Shee and they had two sons, Lee Gim, born 14 February 1889 and Lee Ling Hung, born 28 November 1901. Lee Share Yung’s paternal grandparents were Lee Sing Tem and Lew Shee. He had an older brother, Lee Seah Fook, living in California. The parents of his wife, Toy Shee, were Toy Lem Tick and Low Shee. The Reference Sheets in the files also contains Seattle file numbers for Lee Gok Suey’s cousin, Lee Gwok Ying (7030/13310); uncle, Lee Gim Jeow (7030/4521); Lee Gwock Ying, Lee Gim Jeow’s son, (7030/13310). 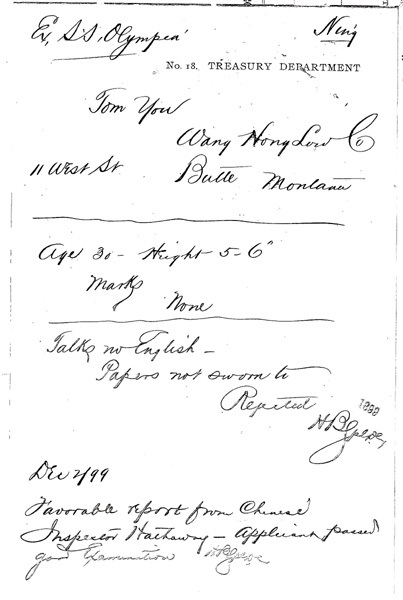 “Tom You Admittance Form,” 1899, Chinese Exclusion Act case files, RG 85, National Archives-Seattle, Tom You file, Seattle, Box 88, Case 15519. This is an example of an early case file admittance form. Early files did not require a formal interrogation but the form included the basic information—Tom You arrived in Seattle on the S.S. Olympia. He was a partner of the Wang Hong Low Company at 11 West Street, Butte, Montana. He was 30 years old, 5 feet 6 inches, and had no distinguishing marks. He did not speak English. On 2 December 1899 Tom You received a favorable report from the Chinese Inspector Hathaway. The report was signed by H. B. Spede. Tom You’s case is more complicated than it appeared from his final admittance form. 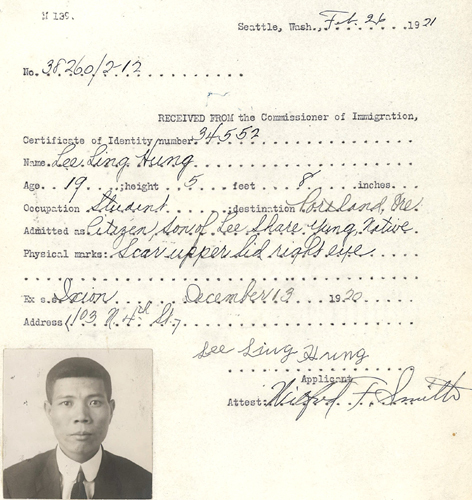 Other paperwork in his file shows that he arrived in Seattle on 3 October 1899 and was rejected. The case was appealed and the papers were sent to the Collector of Customs in Great Falls, Montana for investigation. More testimony was obtained to verify that Tom You was a merchant and not a laborer. Affidavits in his favor were filed in Silver Bow County, Montana by John E. McCormick, Charles W. Fisher, T. M. Hodgens, Jesse R. Wharton, and C. H. Harper. These reputable white males swore that Tom You sometimes known as Hum Yu was living as a merchant and did not in any way partake in manual labor on any kind. 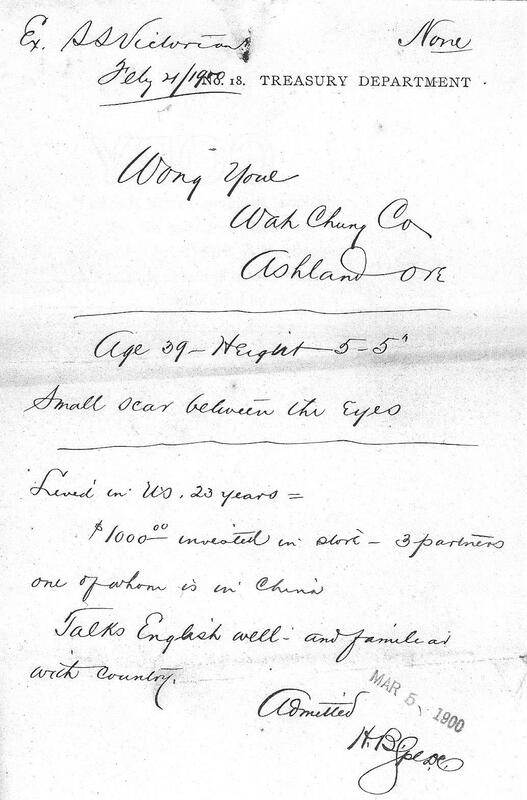 “Wong Youe Admittance Form,” 1900, Chinese Exclusion Act case files, RG 85, National Archives-Seattle, Wong Youe file, Seattle, Box RS 89, Case 15598. Wong Youe was 39 years old, five feet five inches tall, and had a small scar between his eyes. He had been living in the United States for 23 years. As one of three partners in the Wah Chung Company in Ashland, Oregon, he had invested $1,000 in the store. One of the partners was living in China. Wong Youe could speak English well and was familiar with the United States. On 13 February 1897, before Wong Youe left the United States, M.N. Long, P. W. Paulson, W.H. Brunk, and G. W. Vanpel signed a statement vouching for Wong Youe. Wong Youe returned to Port Townsend, Washington on 21 February 1900 on the s. s. Victoria. Upon his return sworn affidavits were taken from G. W. Vanpel, a resident of Ashland for ten years; F. M. Drake, a resident in Ashland for twenty years; R. A. Minkler, a resident of Ashland for seven years; and M. N. Long, a resident of Oregon for seventeen years. They all testified that Wong Youe “is NOT a laborer but is an actual BONA FIDE merchant” for more than two years prior to his departure from the United States on 27th day of February 1897. They stated that he worked for the Wah Chung Company on Oak Street, Ashland, Oregon. 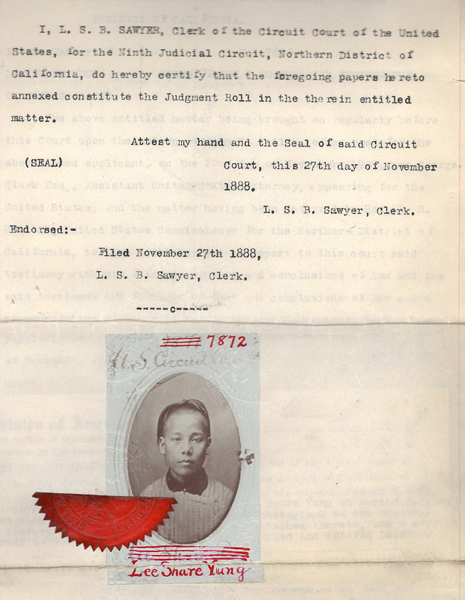 “Wong Youe Affidavit Photo,” 1900, Chinese Exclusion Act case files, RG 85, National Archives-Seattle, Wong Youe file, Seattle, Box RS 89, Case 15598. 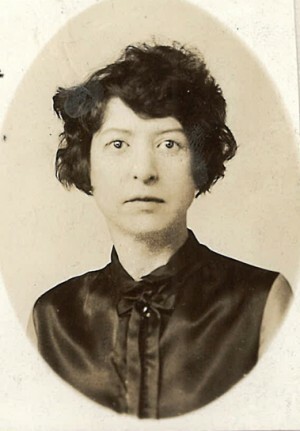 Photo of Cleo Barnes, 1926, Chinese Exclusion Act case files, RG 85, National Archives-Seattle, Yee Yook Poy file, Seattle, Box 1019, Case 7060/17-19. 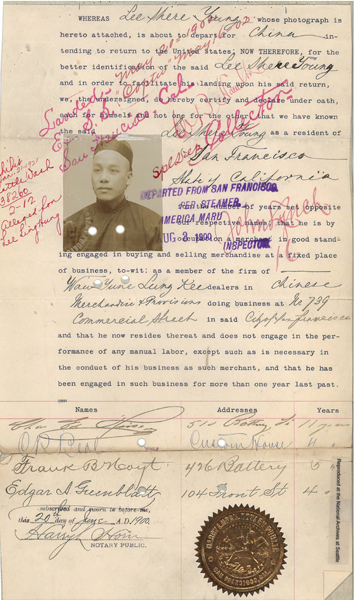 Photo Ben J. Miller, 1926, Chinese Exclusion Act case files, RG 85, National Archives-Seattle, Yee Yook Poy file, Seattle, Box 1019, Case 7060/17-19. It is unusual for affidavits in these files to include photos of witnesses. It is rare to see a photo of a woman included with her affidavit and it is extremely rare to have an affidavit from an African-American and have his photograph included. The affiants were swearing that they were personally acquainted with Yee Jung Sam, the father of Yee Yook Poy, the subject of this file. Yee Jung Sam had a Sec. 6 certificate as a merchant and was trying to get approval for his son to enter the U.S. as the minor son of a merchant. Mrs. Cleo Barnes, age 40, a stenographer and saleslady, residing at 67 S. Fifth Street, Columbus, Ohio, had known Yee Jung Sam since 1924. He was a tea merchant at 148 East State Street in Columbus. Ben J. Miller, age 30, a porter who cleaned the floors and washed the windows of the business was residing at 1400 Hawthorne Avenue, Columbus, Ohio. Charles S. Boyd, Superintendent of the Capital City Laundry and Dry Cleaning company, residing at 75 Whitethorne Avenue, Columbus. Thomas B. Johnson, engaged in the fish business at 116-118 S. Fourth Street, residing at 340 Northridge Road, Columbus, Ohio. Yee Que Jock, also known as Yee San, was manager of Yee San Company. The mercantile status of Yee San Company was investigated by Thomas Thomas, District Director, Immigration Service, Cincinnati, Ohio and found to be a bona fide mercantile establishment. Thomas was impressed by the reputable and creditable witnesses and recommended that the application be granted yet Yee Yook Pay’s was denied admission and was placed on board the S.S. President McKinley on 5 December 1927 for return to China.